Q. Where can I find information about MRSA? I need to write an evidence based paper on MRSA (methycillin resistant staphylococcus aureus) and I am not sure where to find the information on the school's library site. You can find evidential-quality articles about MRSA in the CINAHL Complete and the CINAHL Plus with Full Text databases. To get to CINAHL, go to the library website, select the Databases tab, and click on the A-Z Databases link or scroll down the drop down menu to find and select CINAHL. NOTE: If you are off campus, you will need your H number to access the databases. To find articles about MRSA, click on "CINAHL Headings" in the blue bar at the top of the page. In the search box, type MRSA and select the "Relevancy Ranked" radial button. When you click Browse, this will bring up a list of terms used in the database. It will say "For MRSA, use ...." You want to find the correct term and select the checkbox that says "Major Concept." When you check that box, it will bring up a blue list of additional "subheadings." You can ignore these and just click the big green "Search Database" button. This search brings up hundreds of articles. Before you start looking at those results, however, we can narrow them down to a less overwhelming number! On the left-hand side of the screen you should see a section that says "Refine Your Results." 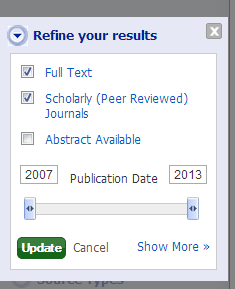 You want to select the checkboxes for "Full Text" and "Scholarly (Peer Reviewed) Journals" and then click "Update." This will narrow your results to articles that qualify at the lowest level of the evidence-based pyramid.